As General Manager, Healthcare Digital for GE Healthcare in EMEA, Sara is responsible for the growth of GE Healthcare’s digital business through the region. She has been with GE for 18 years, holding a variety of commercial roles within the Healthcare business, including as GM for Business Operations for the Digital business, and GM for Digital Pathology. Until 2012, Sara served as the EMEA Services Marketing & Commercial Leader, responsible for driving growth across service and sales delivery, as well as marketing initiatives. Prior to this, she spent five years as the EMEA Radiology & Mammography Strategy Product Marketing Manager, responsible for marketing segmentation and strategy. 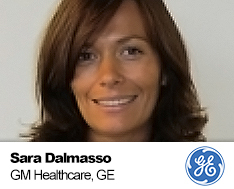 Sara joined GE Healthcare in 2000, holding a variety of operations and marketing roles. Sara Dalmasso holds a Bachelor Degree in General Management and Marketing from the Write State University in Ohio and a Master of Business Administration and Management, International Business from the Ecole Supérieure des Sciences Commerciales d’Angers (ESSCA) in France. She is Lean Six Sigma Black belt certified.